Stock status is current as of 4/23/2019 12:30 PMET. QNAP TVS-EC1580MU-SAS-RP R2 is the world's first unified NAS supporting Auto Tiering to deliver ongoing optimization of data across high-performance SSD, SAS drives and high-capacity SATA disks. The TVS-EC1580MU-SAS-RP R2 delivers exceptional performance and supports cross-platform file sharing, comprehensive backup solutions, iSCSI & virtualization applications, and more practical business functions. 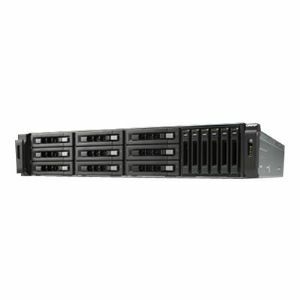 With the powerful QTS operating system, the TVS-EC1580MU-SAS-RP R2 performs as a reliable, scalable and unbeatable unified and tiered storage solution for businesses. Expansion Bays: 9 (total) / 9 (free) x hot-swap - 2.5" / 3.5" � 6 (total) / 6 (free) x hot-swap - 2.5"